Posted on Fri, Mar 23, 2012 : 8:04 a.m.
Editor’s note: The author penned this essay several hours after the March 15 tornado that struck the Dexter area. Images that originated just two miles from our home have been transmitted to satellites 22,000 miles above earth and then back down again and appear on our television screen. We sit in stunned silence as we watch our friends and neighbors milling in the streets outside their homes, assessing damage, giving comfort, being comforted. 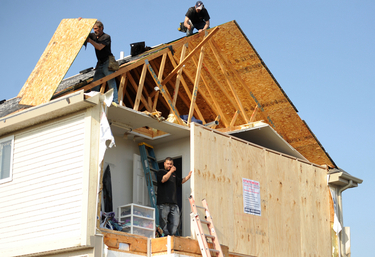 Clean up workers remove debris and reinforce one of the many homes damaged by the March 15 tornado that hit Dexter. And much comfort is needed. Over 100 homes are damaged - more than a dozen completely destroyed. Unrecognizable remnants of people's lives litter the leafless branches of the remaining trees. Furniture and photographs float in the streets, winding their way toward uncaring storm drains. The images are despairing, but the atmosphere is not. People are left homeless, but not helpless. Hundreds of volunteers, many of them teenagers, organize clean up and donation efforts around town. Cell phones and social networking sites are flooded with offers of spare bedrooms and running water for those without. People whose houses sustained damage are out helping their neighbors who lost everything. There are surprisingly few tears. We are shaken, but not shattered. There's an adage that states, “What doesn't kill you makes you stronger.” We take in those life experiences that are difficult, we learn from them and they strengthen us. Today, in the aftermath of the unexpected, we must keep that idea and hold it close. This disaster will not define us. Our reaction to it will be what people remember - the way we band together, helping one another through this difficult time. The people of Dexter will absorb this crisis, and like steel tempered by flame, we will emerge stronger.